Keep Lady Independence and Sir Hatcher II streaming online! ‘Lady Independence’ was hatched and released by the American Eagle Foundation. 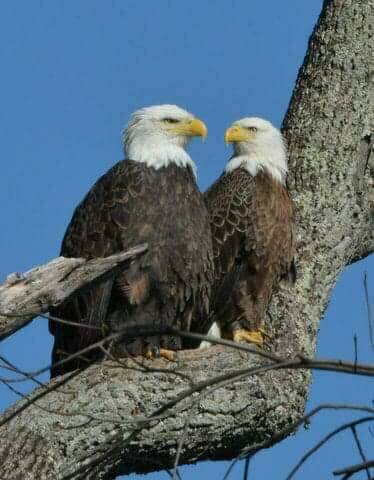 When she reached sexual maturity, she and her mate ‘Sir Hatcher’ took up residence just 5 miles from the American Eagle Foundation. They produced several young since 2013. The AEF named her Lady Independence, in honor of her mother (Independence). Her mate was named Sir Hatcher in honor of AEF friend, mentor and supporter Bob Hatcher—the man who made the AEF’s hacking program possible in the early 1990s. In 2018, Lady returned with a new mate, sporting an ankle identifying band. Many attempts were made to capture the new male’s band number, but it wasn’t until March 23, 2018 that positive identification was made. Our high-definition video cams focused in on the ankle of the new male, and saw the USFWS band number clearly: (USFWS #629-43867). To continue honoring the contributions of Bob Hatcher to the restoration of the Bald Eagle in Tennessee, the new male will be named Sir Hatcher II. Read The Full Story of Lady and the original Sir Hatcher.